But Dodge offers a 1.4-liter turbocharged I4 in the Aero high gas mileage model. That engine generates 160 horsepower and 184 ft.-lbs. of torque to make it fun and frugal, as it’s rated 28 mpg city and 41 mpg highway. 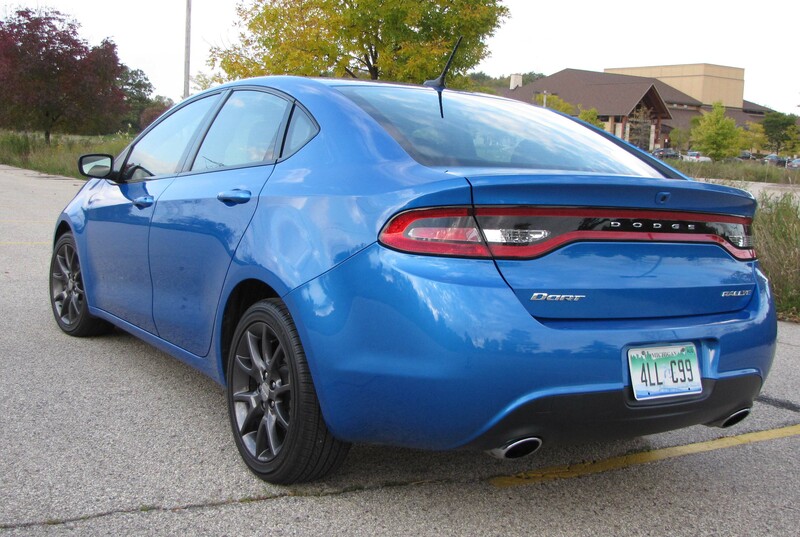 The tested SXT model features the 2.4-liter MultiAir I4 that creates 184 horses and a 174 torque rating. The base SE model features a 2.0-liter I4 that still manages 160 horses, but just 148 ft.-lbs. of torque. I’d go with either the Aero that will run you about $21 grand or the SXT and above for the MultiAir engine. The SXT starts at $19,000 and not many vehicles that will haul four adults fairly comfortably start that low. Its horsey four-cylinder has plenty of power, but mated with the optional $1,250 6-speed automatic, its power is modest under normal acceleration. You have to tromp the gas pedal to get all those ponies galloping and then the engine noise rises substantially. Still, the handling is fairly responsive and there’s a heavy feel to the steering wheel that makes the car seem more substantial than it is. 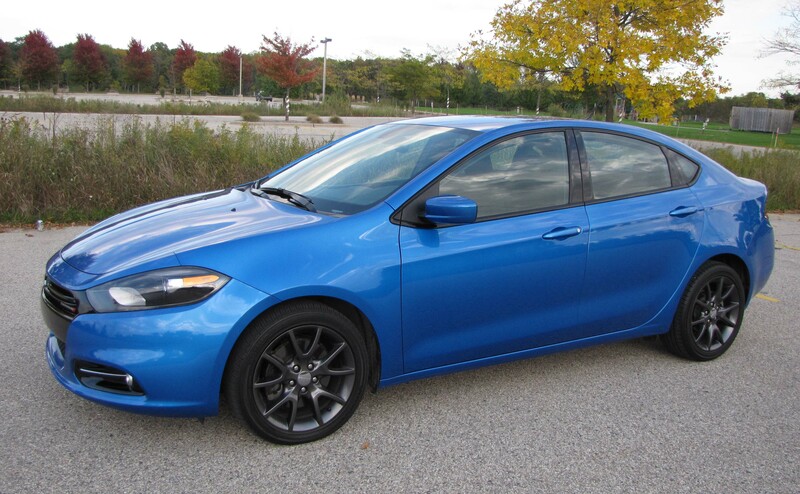 In fact, the Dart feels pretty heavy, another surprise for a compact car that tips the scales at 3,165 lbs. Dart rides on a 106.4-inch wheelbase and that normally would provide a decent ride over our bumpy streets and highways. But this has what Dodge calls a touring suspension, part of the modestly priced ($595) Rallye package. Apparently that firms the ride and gives the car a less refined and less well-cushioned ride. There’s what I call suspension thump here, sometimes feeling as if the car is bottoming out on its shocks. Braking is fine with four-wheel discs and stability and traction control. It wasn’t all that long ago that none of that came on an entry-level car. 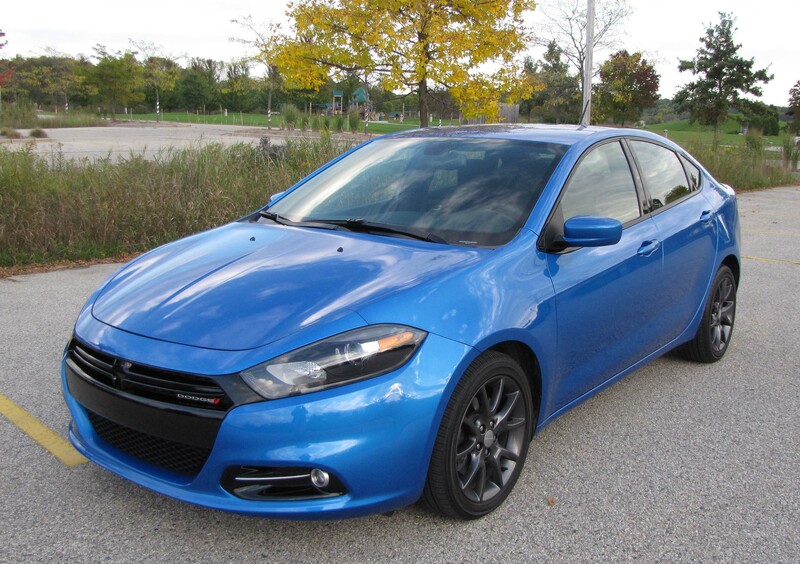 Inside is where the Dart excels and will win over some young buyers looking for their first new car. 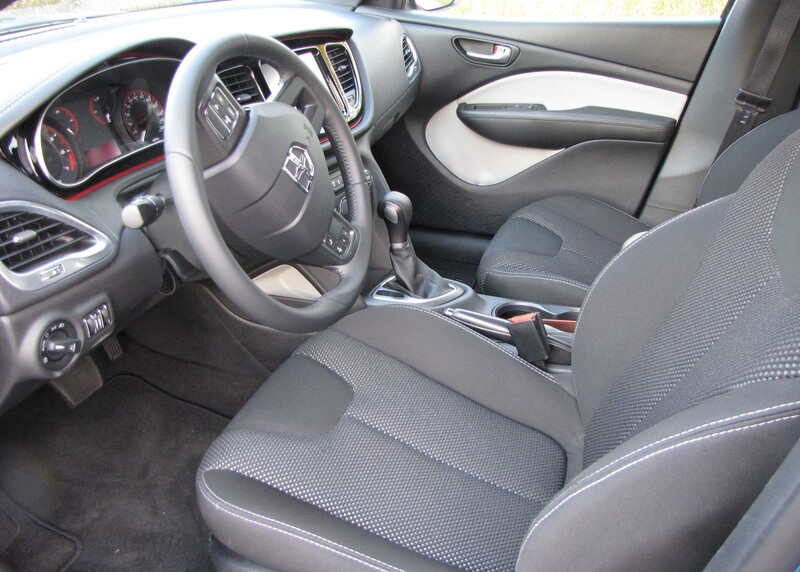 To begin with, Dart’s interior looks good, not cheap. The dash has some style, this model including a red illuminated trim ring around the entire dash. That’s part of another modest option package. For $595 you get that trim, a larger 8.4-inch touch screen with Uconnect, a USB port, iPod control and backup camera. The camera alone is worth the price bump. The gauge pod also is attractive and looks more upscale than the car’s price with red rings around the main gauges, plus other dash knobs. The test car’s dash was soft-touch plastic and the seats an attractive blend of black cloth designs, plus gray cloth inserts in the door panels. Seats also featured gray stitching that looked sharp. Dodge’s touch screen is easy to use with big touch buttons, plus real volume and tuning knobs, and a big knob to adjust the manual climate control system. Climate temps and directional controls are on the touch screen and if you upgrade a bit more you get heated seats and a heated steering wheel. Some pricier cars still don’t offer that later feature. Hrrumph! Seating is comfortable too with well contoured manual seats. The driver’s seat includes a pump handle on the side to raise and lower it and the steering wheel is manual tilt/telescope with radio, cruise and trip computer buttons on the hub. Standard is an infrared key, visors that slide, automatic lights and 60/40 split fold-down rear seat. Trunk space behind that is quite good for this size car. The test car also added a $195 radio upgrade that gives you a Garmin GPS and five years of SiriusXM traffic and travel service. A compact spare adds $395 to the cost and that Rallye package mentioned earlier includes fancier 17-inch wheels, leather-wrapped steering wheel and shifter knob along with floor mats and special badging and trim. All told the test car went from its $19 grand starting price to $23,620, including $995 of delivery fees. That’s still a bargain in today’s entry-level market. Consider too that gas mileage is excellent. I managed 29.1 mpg in about 60% city driving. That’s nearly identical to what I got more than a year ago in a Dart with the same engine-transmission combo. The EPA rates this at 23 mpg city and 35 mpg highway and the MultiAir engine drinks regular gas. There are many options for the first-time buyer or a buyer looking for a practical low-cost high-content sedan. Costs can range from $18 grand to $26 grand and you’ll get a car that’s well equipped and easy on gas. 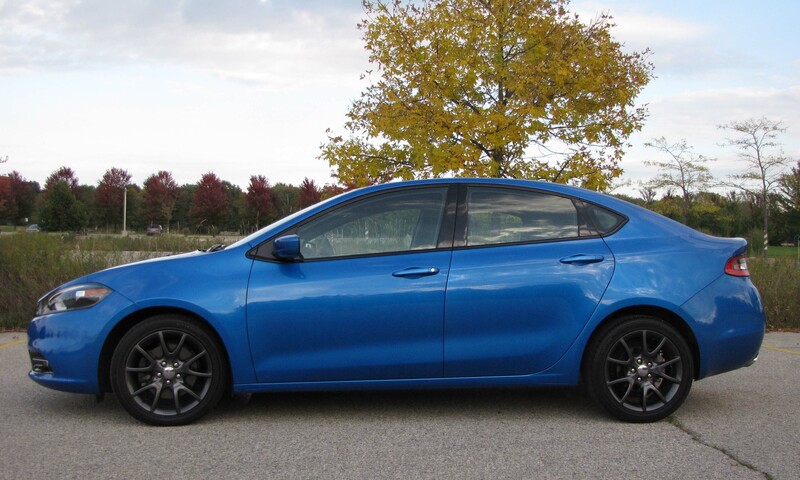 Folks considering a Honda Civic, Toyota Corolla, Ford Focus, Hyundai Elantra or Chevy Cruze should certainly drive a Dart and compare pricing for the features they want. Choices abound! Hits: Sporty looks, nice handling, attractive dash and large touch screen, plus volume and fan knobs, good-sized trunk, good fuel economy and high-value pricing. Misses: Modest acceleration unless you tromp it, feels a bit heavy and ride isn’t well cushioned.